Recently while researching the industrialist Chong Hu-kwong of Tai Loong Weaving I came across above image of donors’ memorial wall (similar to ones you can find at Tung Wah Group of Hospitals and Po Leung Kuk) at one of the buildings of the abandoned Kwai Chung Public School. In the 1950s, Kwai Chung transformed from a rural village to an industrial district and the related increase in population created the demand for a new public school. Founded in 1952, the school expanded in 1959 with the generous support of local business leaders which included a combination of village elders and industrialists whose pictures are featured on this wall which was unveiled in June 1960. The school was abandoned in 2007 and due to neglect, many of its buildings were vandalized with graffiti (including part of this wall). Ip Tak-fan (葉德範) – chairman of Tsuen Wan Chamber of Commerce and Tsuen Wan Rural Committee; founder of Yan Chai Hospital but died in 1962 before its completion. 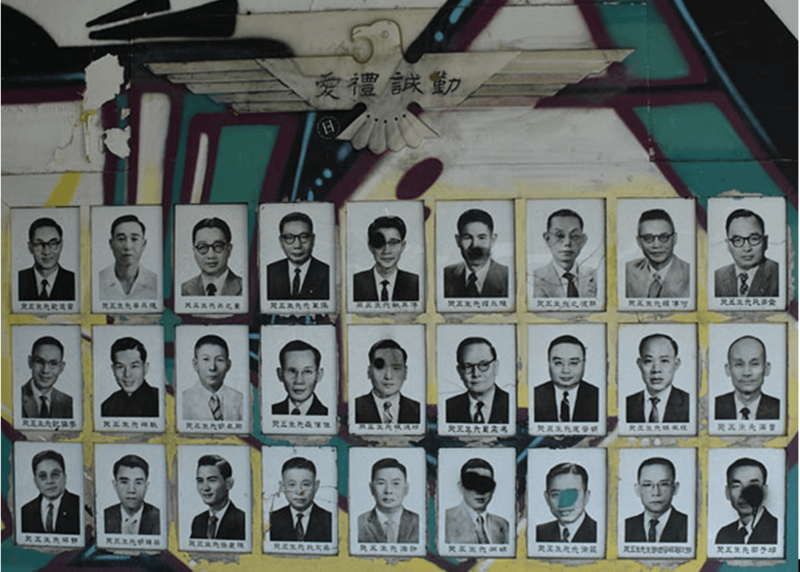 Chan Wing-wah (陳永華) – likely a member of the Chan clan of Sam Tung Uk in Tsuen Wan and related to Chan Wing-yiu who is also on this wall and Chan Wing-on, the first chairman of the Tsuen Wan Rural Committee. Cheng Chek-chee (鄭植之, 1898-1983)- Chiuchow co-founder of the Chiaphua Group aka “King of Industries” with involvement in steel, kitchenware, watches, torchlights, electronics, paper etc. Ho Chuen-yiu (何傳耀) J.P. – chairman of Tsuen Wan Rural Committee (1954-60); distributor of Texaco oil in New Territories. Tsuen Wan Ho Chuen Yiu Memorial College is named after him. Cha Chi-ming (查濟民, 1914-2007) – Shanghainese founder of China Dyeing and the Cha Textile Group. Later known for the Discovery Bay development. Chau Cheuk-ming (周卓明) – major landlord in the Tsuen Wan area but originally from Chiu Chow. Yan Chai Hospital Chau Cheuk ming School of Nursing is named after him. Ching Chun-kau (程振球) – real estate developer who bought Far East Motors site in Kowloon. (see article on Far East Motors). Vice chairman of Chung Shing Benevolent Society from 1957-1964 and Yuen Yuen Institute in Tsuen Wan. Also was director of Tung Wah and Pok Oi Hospitals. Hui Tim (許添) – vice chairman of Yan Chai Hospital and director of Tsuen Wan Chamber of Commerce. Chong Hu-kwong (莊徐光) – owner of Tai Loong Weaving & Dyeing Mill and Tai Yat Weaving Factory. Director of Tung Wah Hospitals in 1952 and vice chair of Chiuchow Chamber of Commerce. Tang Sang (鄧生) – proprietor of Tin Fook Hong (天福行), a piece goods trading firm. Yau Tze-Tin (邱子田) – member of Chiuchow family that owned Yam Hop Hing Preserved Fruit Factory (任合興) and the famous King Yin Lane Mansion on Stubbs Road. Co-founder of Yan Chai and TWGH Yau Tze-tin Memorial College in Tuen Mun is named after him. This article was first posted on 9th January 2018.